Reusing is music to our ears! 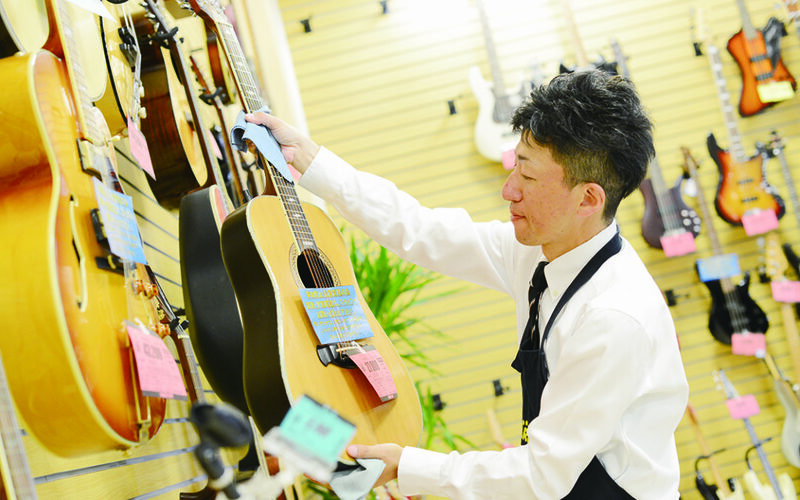 Eco Town’s parent company in Japan features one of the largest collections of quality used musical instruments in the world. Eco Town Hawaii will feature a large inventory of guitars, basses, effects pedals, brass, wind, and string instruments. Fans of electronic music will find a variety of turntables, CDs, mixers and music production equipment. Eco Town also supports musicians with new musical accessories and maintenance supplies to keep our customer’s instruments in good working order. Most instruments come with a warranty and customers have the option of trading up which will net them 20% more in value when compared with selling their items for cash. Our customers appreciate the chance to inspect and play our instruments at Eco Town brick and mortar locations before deciding on their musical investment. The added bonus of a warranty adds confidence to their purchase. Our highly trained staff is capable of most warranty work, and if unable to repair in house, customer’s goods will be sent out to our expert partners for warranty work. Sell us your gear! We buy all used gear no matter the condition. Just bring it in for a free assessment and our friendly staff will present an offer to purchase. No pressure and no haggling makes selling to Eco Town an easy and straightforward transaction. Opting for store credit adds 20% more value to our customers. We are looking forward to opening our doors to Hawaii’s diverse and talented musicians! We stopped taking in used dishware and non brand name clothes. New ECO TOWN store will come to Ala Moana Center! !